A cottage pie with a difference. I love anything made with minced beef, especially cottage pie. I also love baked beans, so combining the two was a winning combination for me. Sauté the beef and onion in Fry Light until the onion is soft and the beef is cooked. Add the passata, baked beans and bouillon powder. 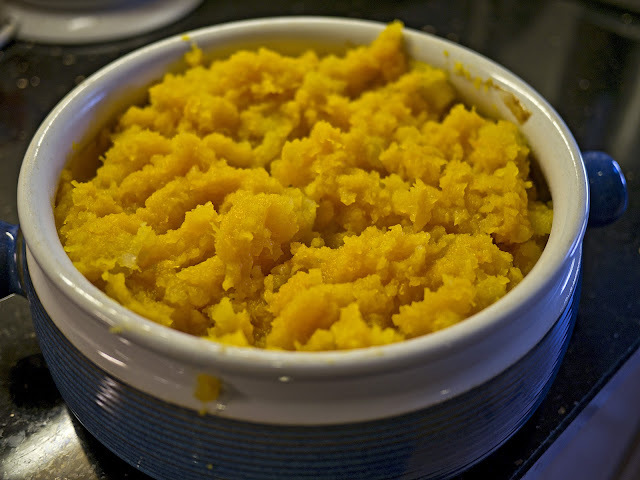 Peel, dice and boil the swede and squash until tender (the swede will take longer than the squash, so cook them in separate pans), then mash together with a potato masher, adding the bouillon powder and a little of the cooking liquid if the mixture is too dry (unlikely). Place the beef and bean mix in an oven-proof dish and top with the swede and squash mash. Bake at 220°C for 15-20 minutes until slightly browned on top and cooked through. Serve with vegetables of your choice and Slimming World chips.